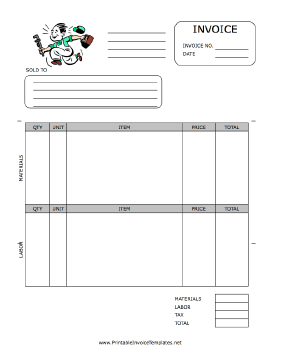 A printable invoice for use by a plumber or plumbing firm, featuring a retro cartoon graphic of a plumber rushing to work with his wrench. It has spaces to note quantity, unit, item, price, and more, separated by materials and labor. It is available in PDF, DOC, or XLS (spreadsheet) format.